On Monday, in Seattle, there was a groundbreaking for the first of 12 livable buildings to be completed here. This six-story building is being billed as the greenest commercial building on earth. 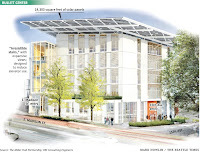 It will be the largest net-zero energy and net-zero water building ever built. I currently work in a super green building but I'm exceedingly jealous of some of the things being done here. Image courtesy of The Seattle Times (click to see more features of the building). Very cool indeed. I wonder how the initial building costs and annual costs to run/maintain/repair/etc are compared to a "normal" building of similar size. It would be fantastic if the yearly expenses were low enough to entice others from a pure cost savings standpoint to build similar buildings. Don't know about the cost, but there won't be a water, power or sewage bill since the building provides it's own on all three. Very neat. The Heifer project building here in Little Rock is very similar. I don't think they have zero sewage, but know the grey water and rain water is all recycled into a really cool system that is beautiful to look at too. I love the "irresistible stairs". When I was in South America we stayed with a friend in the city. He lived on the 5th floor of an apartment. There were no elevators. None. It was unheard of and when I (the American) asked why I was told it would be wasteful and unnessary! The staircase was concrete and outside. If it was raining, you got wet. Amazing. They also don't use dryers--too wasteful! Love it!